The good ship Brexit is leaving 2017 in slightly better shape than it entered it. At the time of writing the UK and the EU have agreed that negotiations should move to the 2nd stage and therefore we can start talking about trade. This progress can easily be undone by a lack of coherence however. Take the agreement on Northern Ireland; the deal is a classic bit of EU fudge and is not the paean to certainty for trade and investment that Brexiteers say it is. Within the text released by both parties the UK remains committed to North-South cooperation whilst guaranteeing against a hard border and that “the United Kingdom’s intention is to achieve these objectives through the overall EU-UK relationship”. That sounds like a post-it note saying “Fix Me”. Similarly, we are still unclear as to what trading relationship the UK government ideally wants if we are to leave the single market and the customs union. A week is a long time in politics but 2 years is absolutely nothing in trade negotiations. While the rest of the world’s growth trajectory is set to continue higher, the UK is likely to be saddled by political uncertainty that stymies expansion. GBP is the combination of consumption, investment, government spending and trade; every single one has been damaged by the political ideology of Brexit and the inability of the government to progress the ramming the squarest of pegs in the roundest of holes. The pressure points will be felt predominantly in the labour market; we foresee an increase in unemployment and a continuation of real wage losses/stagnation through 2018. We cannot at the moment therefore price in an additional interest rate rise by the Bank of England in 2018. For the pound the most crucial positive impetus would be the agreement on a transitional deal that eliminates the chances that the UK will have to settle for some cliff-edge deal that propels the UK out of the EU without a trade deal. The reason why the UK economic picture at the moment is a crawl and not a collapse is that, to all intents and purposes, nothing has changed. Sterling performance is mirroring this data cycle; far from good, far from terrible but capped by the overriding fear that the 29th March 2019 is going to see the world irrevocably change for the worse. Sterling’s reaction would depend on how long any transitional deal would last but a 2yr deal as a start could easily see GBPUSD hit 1.40 in the initial euphoria. Theresa May would have a job at home of explaining it at home to a Brexiteer cabinet and such an agreement could lead to sterling declines as investors fidget with the idea of another general election being called. 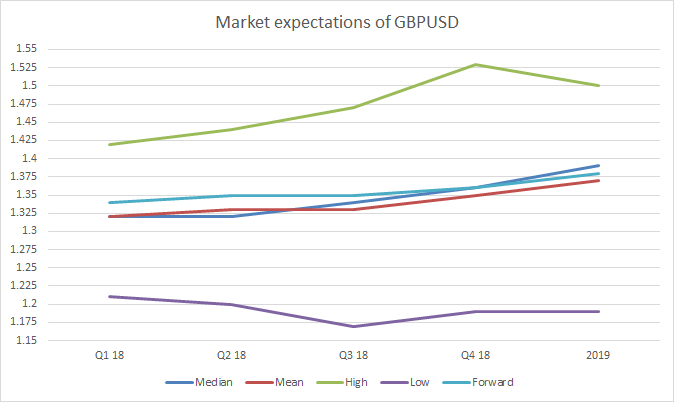 The old song lyric goes ‘nobody said it would be easy’ and GBP’s performance next year is likely to echo such a sentiment. Gains will be sold, losses will be bought and a focus on Westminster will drive the day to day to allow it to continue as the noisiest currency out there.